Elizabeth "Betty" Bevis, daughter of Elsie Boehme and Ludwig Boehme, wife of the late Denmon F. Bevis, passed away November 1st, 2018. She was born in Brooklyn, NY, December 27th, 1923 and moved to Ringoes, NJ in 1953 and then to Pennington in 1997. Betty graduated from the C.F. Young Business School in NYC. Formerly employed as Personnel Manager for AKZO Engineering, a/k/a Wilson Products in Neshanic, NJ retiring in 1987 after 28 years. While at Wilson, she was a member of the Hunterdon and Somerset County Employers' Industrial Councils. 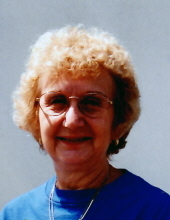 She was a life member of the Flemington Elks Auxiliary and a member of the Kirkpatrick Memorial Presbyterian Church in Ringoes since 1956, where she served on the Board of Deacons and was a member of their Westminster Guild, also of their senior group the "Keenagers", now both currently disbanded. She was active in the Community Garden Club of Hunterdon County, serving many years as their Historian. She won many top awards for horticulture at their annual flower shows. She was also a member of the Four Seasons Garden Club in Pennington. She belonged to the East Amwell Seniors and the Flemington Chapter of the AARP, now disbanded. She is survived by daughters Jill C. Whitney of Stockton, NJ and Denise E Yarashas and son-in-law John "Jack" Yarashas of Kunkletown, PA; two granddaughters Megan Yarashas of Kunkletown, PA and Robyn Brunell and her husband Michael and their two sons, Nathan and Hunter of Kunkletown, PA. She is also survived by two grandsons, Randall Whitney and his fiancé, Jenna and her son, Gabriel of Ringoes, NJ. ; Nicklaus Whitney of Quakertown, PA , his wife, Erin and their four children, Owen, Logan, Fletcher and Hanley. Burial will be private at the Union Cemetery in Ringoes. Funeral services will be held on Monday, November 5, 2018 at 11 AM in Kirkpatrick Memorial Church, Ringoes, NJ. Arrangements are under the direction of the Holcombe-Fisher Funeral Home, 147 Main Street, Flemington, NJ. Church, PO Box 560, Ringoes, NJ 08551. "Email Address" would like to share the life celebration of Elizabeth "Betty" Bevis. Click on the "link" to go to share a favorite memory or leave a condolence message for the family.